New and rebranded A-Q has just signed a management/consultancy deal with renowned manager, Godwin Tom . With hits like ‘Idols’, ‘Bang’, ‘We Are Dreaming’, and ‘Bata Mi’, rapper A-Q has proven that the Hip Hop culture in Nigeria isn’t dead. He has consistently proven his ‘rapability’ and alliterative wordplay and doesn’t intend to stop as he is set to put out a 15-track mixtape in a couple of days. 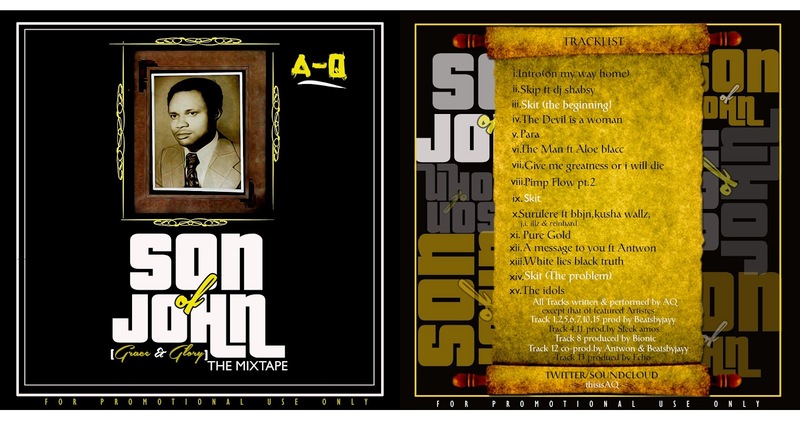 The mixtape which promises to be a classic is titled ‘SON OF JOHN’. Ahead of its release and today being his birthday, here’s a single off the mixtape titled ‘Give Me Greatness Or I’ll Die’ as well as the tracklisting and artwork.